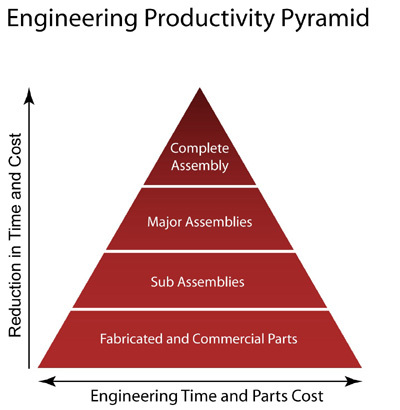 Methodology to move industrial product organizations up The Engineering Productivity Pyramid to achieve reductions in time and cost - from primarily working with fabricated and commercial parts to more assemblies and configuration engineering. Mass customization aims to provide goods and services that meet individual customers' requirements with near mass production efficiency. The mass customization value proposition comes from the dual opportunities of increased market share and higher profit margins. Contact us to see if we can help your organization achieve faster innovation speed while lowering engineering costs and/or implement profitable mass customization!